The last presidential campaign of the 19th century was remarkable in a number of ways. It marked the beginning of the use of the news media in a modern manner. It saw the Democratic Party shift toward the more liberal position it occupies today. It established much of what we now consider the Republican coalition: Northeastern, conservative, pro-business. It was also notable for the rhetorical differences of its two candidates. In what is often thought of as a single-issue campaign, William Jennings Bryan delivered his famous “Cross of Gold” speech but lost the election. Meanwhile, William McKinley addressed a range of topics in more than 300 speeches - without ever leaving his front porch. The campaign of 1896 gave the public one of the most dramatic and interesting battles of political oratory in American history, even though, ironically, its issues faded quickly into insignificance after the election. 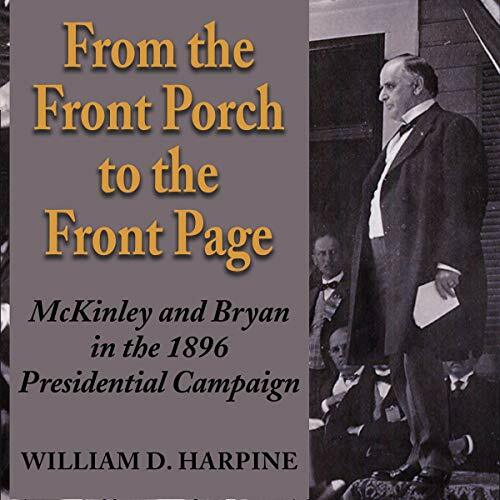 In From the Front Porch to the Front Page, author William D. Harpine traces the campaign month by month to reveal the development of Bryan’s rhetoric and the stability of McKinley’s. He contrasts the divisive oratory Bryan employed to whip up fervor (perhaps explaining the 80 percent turnout in the election) with the lower-keyed unifying strategy McKinley adopted and with McKinley’s astute privileging of rhetorical siting over actual rhetoric. Beyond adding depth and detail to the scholarly understanding of the 1896 presidential campaign itself (and especially the “Cross of Gold” speech), this book casts light on the importance of historical perspective in understanding rhetorical efforts in politics. The audiobook is published by University Press Audiobooks. This book is an excellent analysis of the 1896 presidential campaign, it reveals quite a lot about both the Bryan & the McKinley campaigns -- through analysis of their speeches, news coverage, campaign literature, & campaign approaches -- that does not feature prominently (or at all) in other works on the period. And the book is particularly revealing when compared to the stereotyped/shorthand treatment of the campaign in survey history books (& economic history books). The book is well narrated. It is occasionally repetitive, although that fits with the material the author is using & his chronological arrangement of that material. Recommended.